RJS Stonetops is a proud supplier of Caesarstone products in Canada. Sensible and growing in popularity, Caesarstone quartz kitchen countertops are showing up in an increasing number of homes. Caesarstone quartz comes in a wide variety of colours and styles, making them ideal for mixing and matching to preexisting décor or dream renovation ideas. As manufacturers improve their design techniques, these quartz products allow for increased durability – resistant to scratches, stains, heat, and chemicals without the need for protective staining. For those concerned about health and sanitation – and aren’t we all, to an extent? – you will love to know that Caesarstone quartz is also resistant to mildew and germs due to its non-porous composition. Hygiene is hugely important in the social hub of the home – the kitchen – especially when many or all meals are prepared there. This also means that the cleaning and upkeep regimen is easy, as it requires little to no maintenance and just the swipe of a warm, wet cloth for cleanup. This is what makes Caesarstone quartz both fashionable and practical. As for style and texture, Caesarstone quartz comes in a range of options. This means that you can customize your kitchen to your ultimate vision of the space. Are you thinking classic and traditional? Or do you prefer sleek and modern? Either way, Caesarstone quartz comes in so many different varieties that it won’t be hard to make your dream a reality. Caesarstone quartz comes in all shapes: earthy, natural stone textures or glossy, polished surfaces. Whichever you select, you can be certain that this composite quartz will hold onto its “like new” appearance with minimal upkeep and maintenance on your end, meaning that your space will always look top notch. The value of Caesarstone quartz goes beyond price – it’s about quality reassurance, timelessness, and an installation by a team of highly trained professionals whom you trust. Want to know where to get started with these brilliant quartz products? 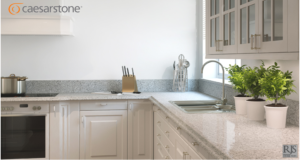 Check out RJS Stonetops’ Comprehensive Guide to Caesarstone Quartz Countertops. Have any questions, comments, or concerns? Reach out to us on our website or on our Facebook page.